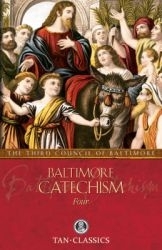 Baltimore Catechism 3 is also known as An Explanation of the Baltimore Catechism and can be used as a reference work or as a teachers manual. It is often used as an advanced textbook. The fascinating explanations of many little known questions pertaining to our Faith will reward the questioning reader. This is the original TAN edition of the Baltimore Catechism, with updated typesetting, fresh new cover, larger format, quality binding and the same trusted content. Option to order full set.